Dungeon Siege II continues the series and offers plenty of improvements over the original Dungeon Siege game while also continuing the story. The game revolves around the war against Valdis with players originally fighting for the evil Valdis as a mercenary. The player is ordered to take over a temple in his name which serves as a tutorial to introduce the player to the game. After they capture the temple players are attacked by Valdis who refuses to pay you for your services and are knocked unconscious while your close friend is killed. Players awake to find they are captive of the dryads who decide to let the player earn their freedom by fighting on the side of good against Valdis. From here the player unravels the mysteries of the game world and attempts to defeat Valdis for revenge. 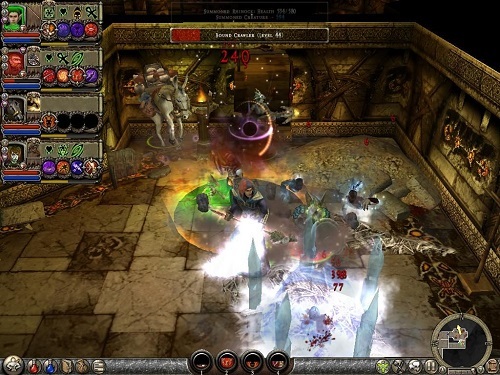 The combat system is very similar to other games in the genre (such as Diablo) but where the game really shines is through the character skill and party system. 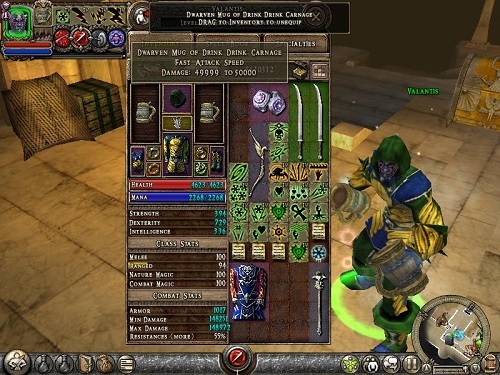 Dungeon Siege II offers four different skill paths for players to choose from including melee, ranged, combat magic and nature magic. There is enough depth in each of these class options that players can play two melee classes completely differently. Multi-classing is also possible but must be carefully used otherwise players will simply end up with a weak ‘jack of all trades’. On top of skills each character gets their own hero powers that provide powerful buffs or attacks that can be used from time to time. The party system works in a similar manner to the original game with players able to have 4 characters in a party which increases to 6 on the highest difficulty. This party can be NPCs that players meet in the storyline, hired NPCs or pets (whos growth is based on the items you feed them). Because players can switch between their active party member at any time players can play every class at once which means you’ll never get bored of your class again. Of the games in the Dungeon Siege series it’s fair to say that Dungeon Siege II was definitely the peak for this franchise. Large improvements over the original game. Impressive class options with plenty of skill depth. Create your own party and swap between party members at will. A lengthy and interesting campaign to follow. Plenty of random items to find and equip.